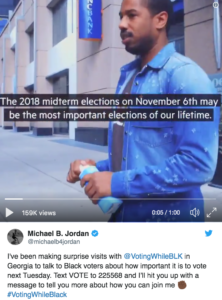 In an effort to increase voter turnout in this year’s midterm elections, the Creed II star went door-knocking in Atlanta, surprising black families and urging them to cast their ballots on Nov. 6. 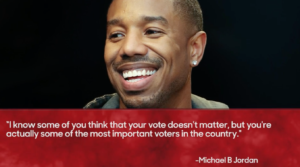 Jordan isn’t the only notable name in Hollywood working to get people to vote. John Legend and Linda Perry teamed up for a new pro-voting song called “Get Up and Vote,” while several actresses — including Jodie Foster, Tea Leoni, Cher, Laverne Cox, Ellen Pompeo and Constance Wu, among others — appear in an ad calling on women to vote in the midterms. Amy Poehler’s Smart Girls initiative is also encouraging young women to vote with a new video, “Smart Girls Vote!,” released this morning.